When we first saw the concept art and game footage, we really didn’t have much to go on. Now, with Linkle’s debut appearance in the recently released Hyrule Warriors Legends, we do — she’s far more than just “girl Link”. 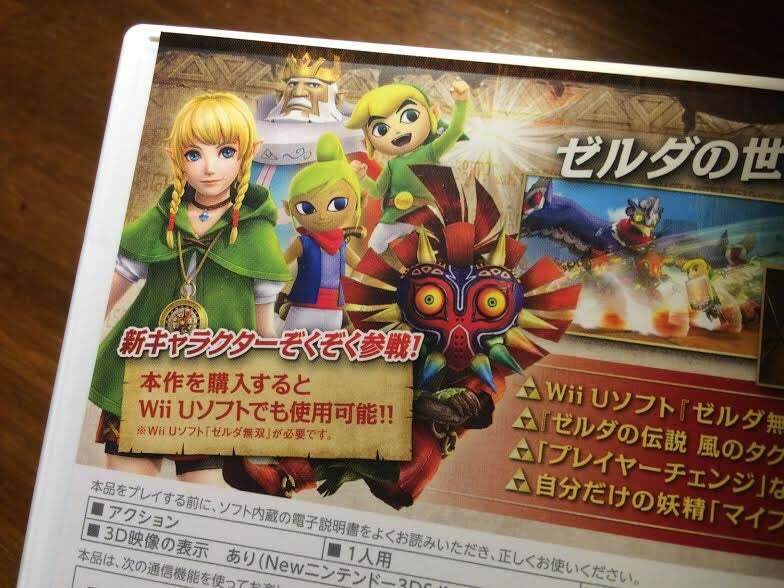 Linkle is one of the new characters added to the 3DS version of Hyrule Warriors and did not appear in the original Wii U game. Previously, her only appearance was in a Hyrule Warriors art book. 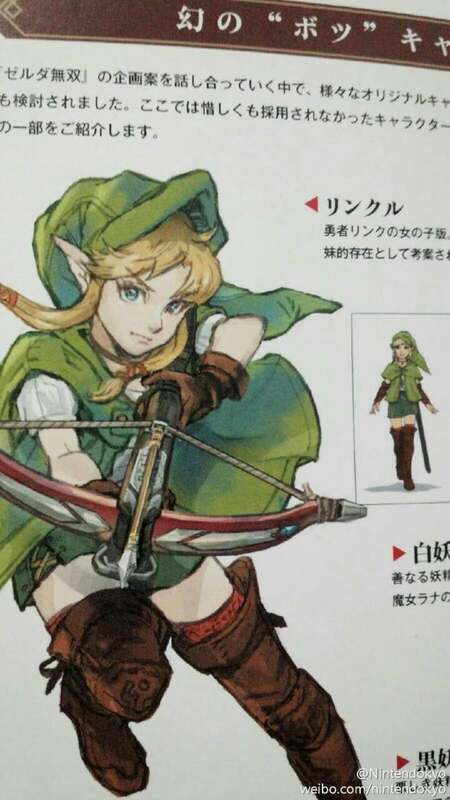 At that time, the official description read, “The girl version of the hero Link” (勇者リンクの女の子版). She was also described as 妹的 or “imouto teki,” which means “little sister-like,” but as Kotaku previously explained, she is not Link’s kid sister. These descriptions can seem like oversimplifications. Linkle is an interesting character in her own right and much more than just the female version of Link. Warning: This article contains some spoilers. The two villagers seem surprised by her get-up, but she explains that her grandmother told her she was a reincarnated hero. She shows them an old compass that her grandmother also gave her as proof. This is her motivation. She wants to keep her town safe, but also wants to fulfil her heroic destiny. This is what motivates her throughout the game. Linkle heads off in one direction, passing a sign that shows Hyrule in another. The narration explains that all she has to go on is an old map, which, it appears, is difficult to read. After each of her missions, we see her puzzled by the map and then running off in the opposite direction from Hyrule. While we do see a sign, I felt this was more of a visual cue to us, the player, that Linkle is going the wrong way. The signs are posted in somewhat unusual places, at least, so I hope this is merely a visual shorthand for us to understand and not commentary on Linkle lacking observation skills. In Hyrule Warriors, different characters are balanced differently for speed and power. Linkle is really good at clearing a room. When she fires her dual crossbows, which fire an endless supply of arrows, she shoots in different directions. They’re ideal for when you are surrounded by enemies. Link’s Crossbow Training, this ain’t. Linkle moves and shoots like she’s starring in an action film (though, she seems somewhat reminiscent of the Demon Hunter from Diablo III). Her spin crossbow attack does look similar to Link’s spin attack, which makes sense because she is a reincarnated hero. So, some of this sounds very Link-ish, no? But that’s the point. She’s a hero — or “yuusha” (勇者) in the original Japanese. If she is in fact the reincarnation of another hero, it would only be natural that she shares elements with Link. This is why, as I mention above, she has a spin-type attack. Her attack isn’t exactly the same, and all this doesn’t mean she is merely a “girl Link”, which I think doesn’t give her enough credit as a character on her own standing. Tecmo Koei had a difficult job cut out for themselves with Hyrule Warriors. First, there’s pleasing Nintendo, which, undoubtedly is no easy feat. Then, there’s pleasing Zelda fans, which is also tough. They needed to create a unique character with her own personality, while touching on the fact that there are obvious expectations for a Link-type character that is a young woman. The way Tecmo Koei handles it seems rather smart. In all the dialogue I’ve seen, the fact that she’s a young woman isn’t brought up that much. Most of the talk during the actual missions is “battle chat” kind of stuff, like, go here, let’s do that, we’re going to win, etc. It’s brought up, they address it no matter how obvious it is, and then they move quickly on to the compass. There’s no, “You’re a girrrrrrrrrrrl?” kind of awkward stuff in any of the dialogue I saw. Likewise, her outfit is also tastefully done, and the hooded cloak looks quite cool. Linkle’s storyline first appears a couple missions in, and after it’s completed, we go back to the main arc. She then re-appears every once in a while as she continues her journey towards Hyrule. This makes for a smooth integration into the main game. Linkle’s missions don’t seem like they are tacked on unnaturally. Throughout her storyline, she keeps either bumping into people or being asked to help. She’s lost, and watching her go in the wrong direction time after time is played as a gag. But even if she doesn’t know where she is, Linkle isn’t out of her element. You never get the feeling that she’s in the wrong place at the wrong time. Rather, she’s in the wrong place at the right time. When she’s thanked for her help, Linkle seems truly happy to be of service. She is a hero. This is what she was born to do. Later in the game, when she comes to Zelda’s aid, the princess, meeting Linkle for the first time, thanks her. Linkle’s reply sums up the character perfectly: “Helping a princess is a natural thing for a hero.” During the same mission, when it gets hairy, she says, “Princess, I will protect you!” Linkle does fulfil her destiny as a hero, and she does make it to Hyrule in the end. Her proudest moment, though, seems to be when she’s thanked for joining the fight. That’s exactly what she was born to do. Hyrule Warriors Legends is not Zelda canon, so while this character is official, she doesn’t yet exist in the chronology. The way that Linkle debuts in Hyrule Warriors Legends, however, does get me excited about if and when she finally makes her appearance in the Zelda timeline, whether that’s appearing in a canonical Zelda game or, better yet, getting a title of her own. Hyrule Warriors Legends was released in Japan on January 21, 2016. It will be released in Europe and North America on March 25, 2016.